Did you know that King James II took the drastic measure of banning golf as a sport? He actually feared the practice of regular golfing would interfere with developing archery skills, the main form of warfare during his time. Fortunately for those who love the game, along with collecting golf memorabilia, The Scottish Golf Society reports their ancestors largely ignored the ban and continued to play. On March 17, 1744, a few golf masters formed the first club called the Company of Gentlemen Golfers and the rest, as they say, is history. The oldest golf balls, known as feather balls, were used for several hundred years through the 1850s. These balls featured leather cases actually stuffed with feathers, according to the Collector's Encyclopedia of Golf Collectibles (Collector Books) by John M. Olman, now out of print but available through used booksellers. "One normally thinks of feathers as soft, however when the ball is filled with enough feathers to fill a top hat, it becomes quite hard," Olman explains in his book. Feather balls with a manufacturer's mark are most desirable, and can be worth hundreds or even thousands to the right collector. Even those without a maker's mark will easily bring more than $500 each. A new type of golf ball, known as a "gutty" by collectors, was developed around 1848. These balls were made of gutta percha, a hard rubbery substance molded from a milky juice obtained from trees sometimes used to make jewelry and buttons as well. Although they were widely used from the late 1800s through about 1910, not many of these true antiques remain on the market today. When collectors do run across one for sale, they'll pay at least $100 to own it in most cases. From about 1898 through 1930, rubber core golf balls came into favor. These are also collectible, but don't bring the high prices of older balls generally selling in the $25-50 range. Folks just beginning to focus on building their golf collections often buy these examples. Balls made after 1930, referred to by Olman as "modern" balls, don't hold much value yet with the exception of a few celebrity and novelty examples. The most popular golf clubs with today's collector feature wooden shafts. Prices for wood shaft clubs can run as high as several thousand dollars each for just the right models. The most valuable clubs will generally date pre-1890, and will feature either long nose woods or what collectors call "early" irons. Clubs were manufactured with wood shafts through the 1930s. Prices vary according to whether or not the heads have scoring or marked faces, so it's best to consult a golf collectibles guide for more information if you run across one of these in your attic. You'll likely have a club worth much less, but with so many intricate details determining values, consulting a reference book or appraiser of sports memorabilia might make sense. In contrast to most modern balls, some steel shaft clubs do hold considerable value. Models made prior to 1945 having unusual shafts or faces are considered to be collectible or "classics." Some of these high quality classic clubs are sought for actually playing the sport while others are better for display purposes. Most late 20th century steel shaft clubs you'll find at garage sales just get the designation of "used" sporting equipment and don't hold much value unless they're in good enough condition to consider hitting the links with them. Another reason to consult a guide on golf collectibles before assuming you've got a $1,000 club lying around the house. Just about anything associated with the game of golf is considered to be collectible. 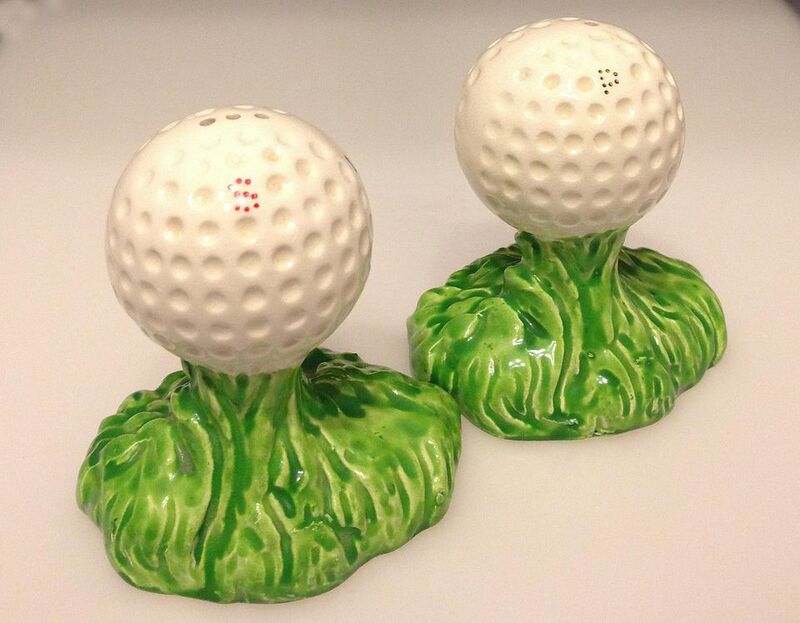 Old golf magazines, china decorated with golfing themes, postcards, and even decorative items such as bookends make nice additions to a golf memorabilia collection. In most cases, of course, older is better and that makes them more expensive. Items produced around or before 1900 will hold the most desirability in this realm. However, looking for clever golf-related items made during the 20th century still holds some appeal and those things can be much more affordable. Large club shaped decanters, salt and pepper shakers (like the ones shown here), miniature liquor bottles shaped like balls, and a host of other contemporary golf memorabilia can comprise or balance a collection.